Over the last couple of days I’ve been watching the Facebook updates rolling in. I wanted to see what other sources I respect had to say about the updates. I’ve seen what Mari Smith had to say about it, as well as The Social Media Hat and Jenn’s Trends and so far it is not good. Facebook is being honest– I like that, but it’s a little bit late, almost 2 years. What Facebook is saying makes sense. As more companies are trying to fight for attention they are posting more often, writing more content and sharing more images. Instead of people having 1500 items in their newsfeeds that Facebook uses their algorithm to sort (they deliver about 300 of that), they are probably getting more potential items in their feed queue. Think about it, a person doesn’t normally unlike as many pages as they like. It’s similar to your Twitter account, the more people you like the more choked up your home feed is. The difference with Twitter is that you have options to unfollow, split up lists of people, search more intelligently and use tools like Hootsuite to manage your feed. As the number of items people subscribe to per day (from every fanpage they’ve ever liked) climbed from that 1500 (this number was mentioned in an old post from Facebook) to many more, the number of those delivered has stayed at 300. This is the number of items Facebook considers the average person is able to view in a day. Now each company or fanpage that is competing gets a lower number of views in that coveted 300 news feed items section. This only makes sense that over time the number of fans (percentage wise) reached will steadily decline- indefinitely until Facebook makes a real change. 1- Very small businesses can’t afford this, or it just isn’t worth the money, but they still have fans and followers they don’t want to abandon. 2- There are only so many places these ads can be placed on Facebook, so while we might reach more people, the cost to advertise will indefinitely increase as well. This happened with Google Adwords, the more companies competing for attention, the higher the cost per click. 3- Inevitably this favors larger companies who can pay for ads and can invest in Facebook (because isn’t the Facebook IPO what this is all about?). Meaning again that large companies get the upper hand. I’m not against big corporations, but I do like to support the little guy (or people like me). 4- In a study done recently by another blog (I can’t remember their name now) they discussed howorganic likes were worth more than likes from ads. Basically the organic likes actually liked a page and were more likely to become engaged with them, while the ads were less likely. So in paying for fans, they are worth less (in general). you are only going to reach a % of them. There is no guarantee that any fan you pay for will ever see even 1 of your updates. The more new pages someone likes in a day, the less likely each of those pages are to show up in the newsfeed. 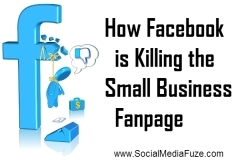 What Does All of This Mean for The Small Business Fanpage? For businesses the cost to be present on Facebook will continue to grow, even as they are less able to keep a decent reach. It will cost more to hire someone for content, management, advertising and ads, as people continuously fight other companies for reach and exposure. It doesn’t matter what the strategy is. If the business can handle the costs they can stay present but they will have a lower percentage of reach. Provide the very BEST content– Only pictures, links, updates, etc that truly make the fan appreciate the company will do, anything subpar will simply fall on deaf ears and lower future reach because of the lack of response. Continually improve ads– Anyone using ads will be competing against the next company using them. There are only a few places in the newsfeed and the ad buyer who is willing to pay the most, or has the most targeted and most responded to ad, will get those positions. Bring your A-game or go home. Find an alternative marketing strategy or social media platform. They are many social media platforms that are much easier to grow on. Consider Twitter, Pinterest, Google+ or a local platform that is active. Remember while Facebook has the numbers, the people there are not necessarily there to like companies but to make personal connections. There are many other places to pursue business ventures. Mike Alton from The Social Media Hat talks about how much more beneficial Google+ is in this post. Jenn Herman is very active on Instagram and helps companies grow there without the same costs and time investment as Facebook. I will continue helping companies with Facebook. Most of the blogging I’ve done focuses on social media in general and Facebook. The strategies I’ve used are still effective, but as this post points out Facebook will continue to be more competitive and prohibitive for small businesses. It is up to you to decide whether it is still effective. For those who find it effective it only makes sense to stick it out until the return is no longer there. For others take one of the suggestions in this post and if you have any questions feel free to ask below. Over the past several months I have started helping more companies with their blogs and content distribution in addition to their social media presence. In future posts I will be writing more about this, and other social media platforms where I have found higher returns on investment. That all being said, what questions do you have? What do you think about Facebook’s announcement and where do you think the social media platform is going? Will you miss Facebook for business if you are leaving? I still am amazed with the number of people still using Facebook for business and getting nothing out of it. Google+ does more for..yes…Free. Yep. I deleted my FB business page months ago and revived my G+ page. Best decision ever. I agree with Scot Duke! G+ is far better. I recently wrote an article similar, only i suppose it was more of a rant? I would love to get everyone to Google+ away from facebook, just like at one point everyone went from myspace to facebook! I agree with what you say about Facebook, but I think the same might happen with Google+ some point in the future. All said, any social media account is at the mercy of the network, and we really have no control over their algorithm changes. They are eventually going to try to monetize since they are after all running a business. It is more prudent for small business to focus more on their website or blog, an asset which they own and control. I read Mari Smith’s post about the upcoming changes and need to pay for posts to be seen, just the other day. As a small business owner and internet marketer for 8 years, I have seen the FB changes come fast and furious over the past 18 months and it has not been positive. I rarely see most of my Real Friends show up in my feed. I almost never see the page I like show up in my feed. The money I pay for advertising on FB is going up and the results are really temporary. Goal for 2014: More focus on G+, Pinterest and I guess it’s time to understand Instagram! Well said, Mary. I have long believed this to be true. In the beginning when advertising began, I could see real results on my clients’ and my own Facebook pages. However, as the market has become oversaturated, the results have almost completely vanished (in what seems like overnight). If you can’t pay $1,000 of dollars in advertising, you will never be able to compete on Facebook. Small businesses simply can’t afford that for the mediocre results Facebook is producing with this option. Such a shame. Just a suggestion… If you’re going to talk about bringing your A-game, you might want to check for spelling errors and formation of sentences. There were quite a bit in this blog. I don’t know if that’s normal for your blog posts, but if it’s not your strong suit you might want to have somebody check that for you. I thought the information was decent, but all the errors were kind of distracting. Don’t feel like you have to post this comment, just wanted to give feedback like you asked. Great post, Mary! It is a shame that Facebook has changed their algo and I have seen a huge decrease in reach on all my pages. I know a lot are talking about moving over to Google+ and I do follow Mike and know he knows his stuff about G+. Would Google+ do the something similar in the future (if that network takes off)? It just goes to show the importance of building an email list (something we control) and a blog (something we also control). I am wondering the same thing that Adam brings up…as Google+ gets more of the businesses leaving Facebook will they do the same thing? I realize this is directed at small businesses and not personal blogs but I still felt compelled to chime in. My blog is small. We’re talking less than 100 visits per day small and only 310-ish fans on my page. I’ve seen the drop in reach and how many were seeing my content. Interestingly though, when I post ONLY text, the reach is much higher than if I put up a blog post with the photo preview. If I do a link and attach a photo, more reach. I don’t get it. We all know Facebook needs to bring in revenue but I just don’t get why it has to come at the expense of small businesses or small personal bloggers like myself. Let the users decide what content they want to read instead of trying to decide for them. This post points to the importance of understanding the faddish nature of all social media. There is no doubt that there is a need for businesses to be seen but it is infinitely more important to get the “fan” to engage with you away from the quick sand nature of Fakebook and other social media. Only then will you be able to see the real results by carrying the conversations on your term and not the temporary rental nature of all social media marketing. It seems Facebook has turned us all into advertisers. I’m not a big fan of Facebook, to be honest. It certainly seems that they’re making it harder for the small businesses and start-up’s to get any appreciable engagement without breaking the bank. I prefer Google +, Pinterest, LinkedIn and Twitter for social platforms. Email list building and creating great content seem to be the best way to gain and keep a following, from a lot of what I’ve been reading the past few months. Absolutely true Beckie, and have you seen much better success on those platforms and through email? I think most have.